Want to explore SkySilk and their features? Read our detailed and informative review below! SkySilk is a relatively new company in the cloud industry offering managed cloud hosting. They use open source technologies and enterprise hardware to deliver easy to use cloud hosting for everyone. Friendly 24/7 support – available via tickets and chat. They also have an online community forum where you, SkySilk, and other members can discuss anything or help resolve issues. They also listen to the community and their customers, always adding new features when users request them. Easy to use platform. Most managed hosting providers tend to make their platform as intuitive and as easy to use as possible, and SkySilk manages to do that. Rewards program. I’ll go into details about it below, but basically, you get SkySilk points for every transaction you do, and you can also redeem points in several other methods like liking them on social media. You can then use the points to either buy more SkySilk resources or get a gift card. Kinda like a cash-back system. This is new to the managed cloud industry, and it’s a fun way to engage with your customers. Root access. You get full root access to your server so you’re free to do and configure anything on your server. Most other managed providers don’t offer root access, so SkySilk is a great alternative if you do need it. Cheap. With all the features they offer, along with their hardware and managed support, their pricing is quite cheap and affordable. …and more. You can find out more about SkySilk and their features on their website. Now let’s go into the details through the whole process. It’s a standard sign up process where you create an account, configure your cloud server and start using it. Couldn’t be easier as everything’s point-and-click. A basic VPS. The name says it all – when you need a basic server without too many features. It’s good for testing purposes, small websites, or simpler apps that don’t require too many resources. A standard VPS. This is what most people would probably use and it’s a great fit for most usage scenarios. You get all of SkySilk’s resources and features (though a bit limited), and these plans are quite cheap. And a premium VPS. When you want to experience everything SkySilk has to offer without limitations. You get the best hardware, best resources, priority support, more rewards points, an option to use AMD hardware (which is rare to find these days for cloud servers), and unlimited transfer. 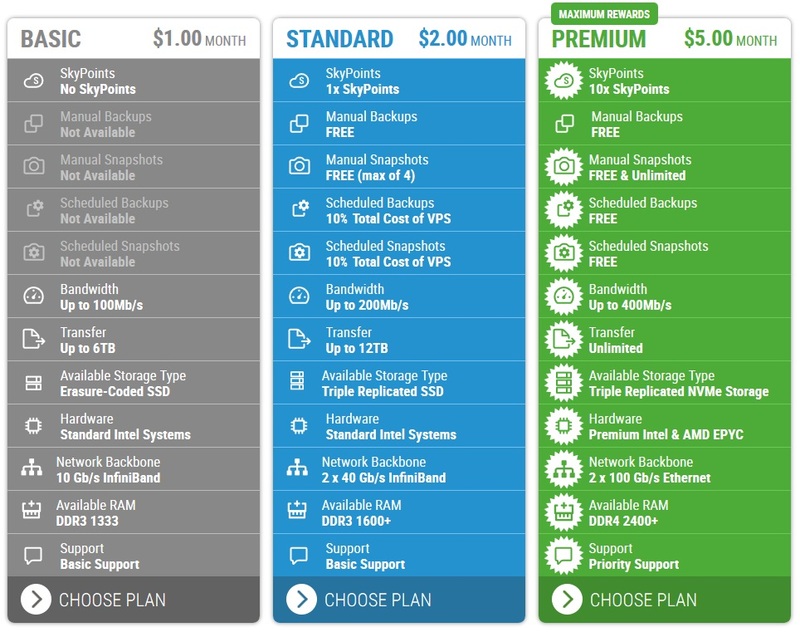 You’d expect these plans to be expensive, but even their premium VPS plans start from $5 per month so they’re very affordable. I’ll review their Standard plans. After you select a type of plan, you’ll get a dozen options for an actual cloud server. Starting from 1 vCPU and 512MB RAM all the way up to 32 vCPUs and 256GB RAM. So whether you need a simple, small server or a powerful cloud server, you’re covered. They only have US data centers at the moment, so at the next step, you can either choose LA or NY as a server location. Although we most often use and prefer US servers, it’s a downside that they don’t have Asia or EU servers to choose from. Most providers do, so it’s an expected option these days. App templates: WordPress, Nextcloud, ownCloud, OpenVPN, SimpleInvoices, Magento, LAMP, NodeJS, MySQL, PostgreSQL, MongoDB, GitLab, Observium, Redmine, DokuWiki, PrestaShop, Moodle, Django, Ruby on Rails, CakePHP, Ansible, Tomcat, Jenkins… This is what they offer at the moment while they’re still in beta, but they’ll add more templates soon. So you’re covered again with whatever app you’re planning on using. What most people need (WordPress and LAMP) are there so it’s all good. However, a LEMP option would be also great to have, but they don’t have it at the moment. Something I noticed about their app templates – they use TurnKey Linux and after choosing an app template you’ll have to finish configuring your server – like creating a password, choosing an email for your WP install and more. It’s easy to use, but if you’re not familiar with Linux at all you’ll probably have issues setting it up. However, they do have detailed tutorials and instructions for all their templates, and they do have 24/7 support so you’ll definitely get help. This will be fixed and improved soon. Once you choose a template, you’re at the final step – configuring the details of your server. Stuff like a name, password, SSH keys, etc. All standard. For our benchmark, we used their WordPress server template and didn’t change or configure anything. This test is just to get an idea of what kind of speed you’d get. The speed depends on many factors – including how you set up your server and your app, which locations you’re visiting from, use of caching etc. I recommend either doing specific tests yourself or running some benchmark software if you’d want to get a better overview of their speed. The homepage fully loaded in 1.1 seconds, which is a better result we got from most other WordPress hosting providers we tested with a similar test. You get view the full results here. Considering the type of hardware they use, a fast server is guaranteed. Their dashboard is very easy to use. It’s the type of dashboard any managed server provider should have. It has GUI options to manage and monitor all your servers. I’ll go into details, but I highly encourage you to use their promo and test a server for free. You can get all the info you’d need about your server like usage details, graphs for monitoring your CPU, RAM, Disk, and Network usage, and other activity on your server. If you don’t have an SSH client installed locally, you can access your server via their SSH and VNC consoles. Backups and Snapshots are easily accessible and manageable via their dashboard, all done with a couple of clicks and automatically. As always, since it’s very easy to do in this case, BACKUP YOUR SERVER BEFORE YOU DO ANY SIGNIFICANT CHANGES TO ANYTHING. This is where “boring old hosting” can become fun for some people. It’s something new to the cloud hosting market, and as far as I’m aware, the first. You basically get SkySilk points that you can later use for your servers or redeem them as a gift card. 100 SkyPoints are worth $1. By using your server. You can earn points by simply using your servers. The more servers you use, the more points you’ll get. Leaving feedback. You can get 100 points by leaving feedback for SkySilk. Help them, and earn yourself points with a minute of work. Signing up. At the moment, they have a sign up promo where if you sign up you get 500 points. Liking them on Facebook and following them on Twitter. It literally takes a single click and you’ll get 100 points for each action. Promos and coupons. They’ll have more promos soon, so follow them on social media and once they announce a new promo, use it and get yourself some points. Account credits. You can redeem your points for account credits, so you can use your servers for free, at least for some period of time. Amazon or Best Buy gift cards. They’re currently in beta, so you can’t actually redeem your points, but once they officially launch you’ll keep your points and you’ll be able to redeem them. They’ll have more ways to earn and redeem points anyway. SkySilk will officially launch to the public on September 1st, 2018. So by the time you’re probably reading this, they’re already launched. No EU/Asia server locations. At the moment they only offer US server locations. They will include more locations in future updates, so if you need EU/Asia server locations you’ll have to wait a bit more. No Windows and Docker support. They don’t offer any Windows server template at the moment, but they are in their planned features. Still new and in beta. You’ll have to wait for them to add all their planned features. So basically everything’s that’s in this list is not available at the moment. I recommend checking out the list before using them. Although they’re quite promising, they still haven’t withstood the test of time. While they’re in beta, you can use servers for free, but you’ll have to verify your account with a credit card. A PayPal option is currently not available. App templates difficult to use for beginners. Though this is arguable, their app templates as not as easy to use as it is with other hosting providers. After selecting a server template, you still have to log in to the server and finish setting it up (passwords and stuff like that). They do have detailed instructions for each template, so you can either follow their tutorials or just contact them and let them help you. In a perfect world, you’d just have to click on an app template and directly get your login details for the app you’re planning on using. The complete setup should be done automatically – and a more automated solution will be implemented soon. No LEMP template. They do have a LAMP server template, but they don’t have a LEMP one. It would be nice to have an Nginx option too. So at the end of the day, almost everything we don’t like about them will soon be “fixed”, which is another testament of how they listen to their community and what the users want. Having in mind all the features they offer, along with their rewards program, I definitely see other providers starting to copy them. Everything’s great, especially their dashboard, even while they’re in beta and still relatively new. And they can only improve their dashboard from here on out. You can find stuff at SkySilk that you don’t usually find anywhere else – like AMD hardware, root access to a managed server, Arch/Gentoo managed servers, and more. It’s the reason why they’ll “get big” and the reason why I think other providers will start “copying” their features and offers. I am a little uncomfortable with SkySilk’s pricing. For example: they advertise “as little as $X a month.” What does that mean? What exactly is their pricing based on? They seem to be unclear about that. The pricing is pretty clear here https://www.skysilk.com/cloud/pricing/ not sure what you want cleared up. The pricing goes up based on how much RAM/Disk space and other resources you get.